Nestled in a valley at the junction of the Mississippi River and the Bayou Lafourche lies Donaldsonville, the “metropolis of the Sugar Belt and a center of the lusty New South,” as the local newspaper, the Donaldsonville Daily Times, described the capital seat of Ascension Parish in the 19th century. The history of this river town, located on a key waterway intersection an hour’s drive south from Baton Rouge, is extensive. Named for its founder, Englishman William Donaldson, the city was originally incorporated by the local Acadian French-speaking population as “La Ville de Donaldson” in 1823, but soon after became known as Donaldsonville. Politics was always a part of the city’s identity. Even as early as 1808, William Donaldson began working to shift the capital of Louisiana from New Orleans to his town. He finally succeeded, and for several years (1829-1831), Donaldsonville actually served as Louisiana’s capital. While serving as the capital, Donaldsonville’s population was still a meager 492. Then, in the years leading up to the Civil War, trading opportunities the city offered along the river attracted relatively large numbers of settlers. Unfortunately, the Civil War all but destroyed the fledgling city. Nevertheless, determination won the day as the town rebuilt, aided especially after 1871 when regular railroad service to New Orleans was established. "The Mysterious Death of Marx Schoenberg"
Jewish life in Donaldsonville followed a similar pattern to other small towns in the bayou. Jews from in and around Germany arrived, settled on the river, established themselves as merchants and storekeepers, and eventually moved on. But the history of Jewish life in Donaldsonville is far from simple. First, Donaldsonville was unique in its demographics. Jews from French-speaking Alsace were drawn by the heavy French presence in the region, settling there en masse in the 19th century. In fact, Alsatian Jewish migration to South Louisiana was a natural progression because of the French heritage and language of the area. Like many Jewish communities, the first institution established, even before a synagogue, was a Jewish cemetery. In Donaldsonville’s case, the cemetery, called Bikur Sholim, was established in 1856. The Jewish cemetery in Donaldsonville illuminates a treasured past. 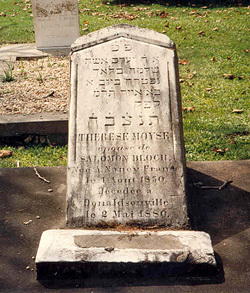 The cemetery’s oldest tombstone is a child’s grave, which reads: “To the Memory of Rachel, Daughter of Isaac and Sarah Friedenthal.” Baby Rachel was only 13 months when she died in 1858. Although it predates the Civil War, Bikur Sholim’s graves are mostly from after the war. Especially noteworthy are some of the anterior rows of the cemetery, consisting of yellow fever epidemic victims from New Orleans from the late 1870s, sneaked out at night for a Jewish burial in order to prevent being interred in mass graves or burned. Alsatian Marx Klein, the town’s first rabbi, was buried in Bikur Sholim in 1908. Another of Donaldsonville’s spiritual leaders, Raphael Singer, while not technically a rabbi, is buried in the cemetery under the epitaph “He served the Lord.” In addition to conducting services, Singer co-owned and operated the local Dollar Store called Singer and Strauss. Also among the 120 Jewish souls buried in Bikur Sholim is Solomon Klotz, who served as Donaldsonville postmaster, Mayor of Napoleonville, and member of the Assumption parish police jury. Of all the stones at Bikur Sholim, perhaps the most intriguing tombstone is one that reads: "in memory of Marx Schoenberg, Born in Germany, 1833, Murdered November 9, 1870. May he rest in peace.” Marx Schoenberg was not simply a Jewish merchant who was killed by a thief or a jealous husband. He was the mayor of Donaldsonville during the tumultuous period of Reconstruction. Born in Germany, Schoenberg moved to Donaldsonville from New Orleans in 1868. His brother-in-law, Morris Marks, also lived in Donaldsonville at the time. Both Marks and Schoenberg were strong Republicans who were politically connected with the party who controlled the state government in New Orleans. Marks was elected as a parish judge in 1868, while Schoenberg was appointed mayor of Donaldsonville in 1870 by Republican Governor Henry Warmoth. During the contested election of 1870, Schoenberg was killed during a standoff with militia troops after a dispute over counting ballots; the exact circumstances of Schoenberg's death were shrouded in conflicting claims and testimony. Marks, who took in Schoenberg's orphaned children, went on to have a long and controversial career in state politics, including several unsuccessful runs for the U.S. House of Representatives. In keeping with Jewish custom, the graves in Bikur Sholim face east and are below ground. While many of the gravestone inscriptions are in English, the majority bear at least some Hebrew and/or French. A few graves have individual fences surrounding them, though most do not. One particular monument in Bikur Sholim that deserves special mention is that of nine-year-old Morris Samuelson, son of Samuel and Rebecca Samuelson. The tomb is remarkable for its porcelain picture of young Morris on the monument. One of Donaldsonville’s largest Jewish families is buried in Bikur Sholim: Henry and Clara Pforzheimer and their seven children arrived in Donaldsonville in the late 1860s. All were lifelong residents of Donaldsonville and members of the Bikur Cholim Synagogue. Interestingly, because the Pforzheimers were a modest-income family, some suggest that their children’s tombstones were paid for by community donations. One of the more unusual funerals to take place in Donaldsonville’s Jewish cemetery was that of Ike Don. Once the owner of a successful menswear business in New York City, Ike Don lost his business during the Great Depression. By 1945 he had moved to New Orleans and found work as a salesperson. He later entered a nursing home in Donaldsonville, where he died in 1972. No rabbi was available in Donaldsonville to conduct the ceremony, so instead the rites were performed by Father James Kinkead, a Catholic priest. Louis Mason, a WWI veteran, was not Jewish, but was buried with his Jewish wife, Hylda. Today, the Jewish cemetery remains the most visible legacy of Jewish life in Donaldsonville. Jews in Donaldsonville first gathered to worship together as early as 1849, but only officially became a congregation around 1860. In that year, 25 members of the community grouped themselves together as a benevolent society under the name of the “Hebrew Bikur Cholim of the Parish of Ascension.” The official act of incorporation was signed by Louisiana Governor Thomas O. Moore on Feb 9, 1860. The society’s charter members were S. Weinchenk, D. Blum, L. Lion, L. Cahn, S. Stern, S. Blum, M. Blum, Sam Bhem, M. Lion, G. Kline, R. Kaufman, M. Cahn, G. Weil, M. Israel, E. Lion, S. Mayer, L. Lehman, and T. Levy. The purpose of the society, according to the charter, was “relieving the sick and destitute, in the promotion of education and religion and such other benevolent acts as may be resolved upon.” From that organization, whose name meant “Visiting the Sick,” sprang the temple. The synagogue was completed in 1871 and dedicated June 9, 1872 with Rabbi H.S. Jacobs of New Orleans officiating. At that time, the population of Jewish citizens in Ascension Parish numbered 179. In May 1878, B’nai Brith organizer Charles Wessolowsky visited Donaldsonville and reported its Jewish citizens to be “good and worthy conductors.” Although the population of “Louisiana’s sugar bowl,” as he called it, was only 2,000, Wessolowsky found that “as usual, our brethren have the sway of business; they have built a handsome synagogue, wherein they hold their regular Sabbath worship and conduct their services under the leadership of Rev. Dr. Sophar—a polished and intelligent gentleman.” According to Wessolowsky, Donaldsonville’s Jewish businesses were closed during Sabbath services. These services were enhanced by the volunteer choir that Wessolowsky praised highly. He met with Congregation Bikur Cholim President G. Fidel, Vice President W. Klappman, and Secretary A. Levy. Wessolowsky also described the importance of Donaldsonville’s Ladies Hebrew Benevolent Society, headed by its President, Mrs. Weinschenk. In the 19th century, the community was led by several large Jewish families: Bloch, Blum, Himmler, Kaufman, Kessler, Katz, Hirsch, Klotz, Lemann, Levy, Pforzheimer, Sternfel, Tobias, and Weil. According to an 1892 article in the American Israelite, Jews from “distances of ten to fifteen miles” still came to Bikur Cholim to be members of the congregation. But the core of Jewish life resided in Donaldsonville, as the Israelite wrote, “the burden of upholding religious institutions, such as public worship [and] Sabbath school, is made to rest chiefly upon the few Jewish families residing in the town of Donaldsonville, while the members residing in the country merely pay their dues and put in an appearance at the synagogue once in a year—on Yom Kippur.” Despite their small numbers, the residents of Donaldsonville were careful to observe the Jewish laws. According to the American Israelite and the Donaldsonville Daily Times, services were always well attended and Jewish businesses were closed on Sabbath mornings and on biblical holidays, which “cannot be said of many other places containing much larger Jewish populations.” Despite its apparent praise, the Israelite was also quick to identify “numerous intermarriages” as a serious problem for the small and geographically isolated Jewish community. In the 1890s, Rev. Leon Straus served as the spiritual head of the Donaldsonville Jewish community. In 1890, the congregation was reorganized; in 1901, its members voted to formally affiliate with the Union of American Hebrew Congregations. During this reorganization, the temple was headed by Rabbi Marx Klein, who resigned in 1905 and passed away in 1908. With Klein gone, it seems that regular services began to fall by the wayside, and over the next several decades, the community dwindled. In 1940, the synagogue could claim about 80 members. The largest families still attending services in Donaldsonville were the Kesslers, Posners, Sternfels, Blochs, and Netters. Although not technically a rabbi, Raphael Singer served as the community’s spiritual leader and the synagogue’s secretary. After Singer’s death in 1947, acting Rabbi Adolph Polmer conducted Hebrew New Year services in the synagogue, gathering Jewish worshippers from adjoining parishes. By the early 1950s, the congregation had disbanded and in 1955, when Bikur Cholim was sold. 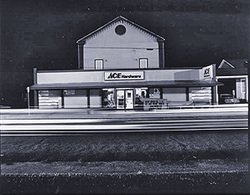 Today, the former synagogue building now stands as an Ace Hardware Store. While Wessolowsky visited in 1878, Donaldsonville Jews did not organize their own chapter of B’nai Brith until 1902, when the Ascension Lodge no. 543 was officially chartered; the chapter boasted some 30 members. By the 1930s, the group had dwindled to 16 names, led by President Leopold Lemmel of Napoleonville, and Secretary Raphael Singer. Despite the predominance of Christians in Donaldsonville, Jews from Bikur Cholim enjoyed close relations with the greater Donaldsonville community. In fact, part of this camaraderie is demonstrated by the fact that the Jewish cemetery, started in 1856, was built on land donated to Bikur Sholim by the Catholic Church. As the Protestant cemetery was next door, there seemed to be little animosity between Jews and Christians. Anti-Semitism was not a problem, though some feared it might soon become another Europe. The story of Lezard Leumas illustrates this concern. Leumas came to America in the 1860s and settled in Donaldsonville. Fearing anti-Semitism, he wanted to keep his Jewish religion secret, and thus reversed the spelling of his last name from “Samuel” to “Leumas.” Appropriately, he named his second son Samuel Leumas. In fact, acceptance proved to be more of a challenge to distinctly Jewish life than anti-Semitism, as many Donaldsonville Jews intermarried and converted to Catholicism. This acceptance is also reflected in the number of local Jews who were elected to political office. Solomon Weinschenck was elected mayor in 1874. In the early 20th century, several Jewish politicians were elected in Donaldsonville: David Israel served as Alderman of the 2nd ward, as postmaster, and as town treasurer. J.E. Blum served as Donaldsonville’s Alderman for the 3rd ward. In nearby Napoleonville, Solomon Klotz and his son Samuel both served multiple terms as mayor in the first half of the 20th century. Despite achieving prominence, Jewish life began a steady decline in the early 20th century. The story of Frenchman Gaston Hirsch says it all. In 1946, Gaston Hirsch arrived in Donaldsonville. After serving in the French army during World War II and even spending four years as a POW, he came to America with his Catholic wife Olga and their child. After a short while in Louisiana, Hirsch owned a men’s clothing store in Donaldsonville, where there were a few Jewish-owned stores left, like David Bloch’s clothing store and the Lemann Brothers store. After his business died out, he became the caretaker of Bikur Sholim Cemetery. Hirsch’s sister, Yvonne, was married to David Bloch, son of Maurice Bloch and Mathilda Himmler, a big Donaldsonville family. By the late 1990s, there were only two Jews left in Donaldsonville. After Hirsch’s death, only Irv Birnbaum, a former employee at Cohn-Turner was left and it was he who maintained Bikur Sholim. He had moved to Donaldsonville in the 1980s and was often profiled by the local media as the “Last Jew in Donaldsonville.” Upon his death, the Jewish community of Donaldsonville was gone.